Fare from MCO to Disney? Has Lyft expanded service in Orlando to WDW Contemporary Resort? Taking an Uber or Lyft around Walt Disney World is actually quite convenient and believe it or not, relatively inexpensive! Take a look below at our top tips on taking Uber and Lyft at the Disney Parks and around Orlando, FL. Our team has experimented personally with taking both Uber and Lyft vehicles for our Disney vacations and would recommend ridesharing at Disney for your family vacation as well! First, if you are new to using Uber or Lyft. Check out our Rideshares 101 help page to get started. What is the cost of an Uber at Walt Disney World? The average cost for an Uber or Lyft within Walt Disney world is $8-$13 per trip. The average wait time for a vehicle is about 4 to 8 minutes. For an exact estimate for your trip, try our fare comparison calculator. What is the cost of Uber or Lyft between Universal Orlando and Walt Disney World? The average Uber cost from Walt Disney World to Universal Orlando is $15-$18. What is the cost of and Uber or Lyft from MCO to Disney World? Uber and Lyft are allowed to pick up and drop off customers at Orlando International Airport. The average fare between MCO and Walt Disney world is $30-$40. Please note this includes an airport surcharge for using a rideshare. Surge Pricing in Walt Disney World. Surge Pricing is not that common in Orlando as there are lot of rideshare drivers in the area, however, if you were to hit a surge it would most likely be between 8 a.m. to 10 a.m. and 9:30 p.m. to 10:30 p.m.
Uber Pick-up and Drop-off Locations at the four Disney Parks. Magic Kingdom: The pickup and drop-off location for the Magic Kingdom is at the Ticket & Transportation Center; from there, you will have to take a monorail or ferry to the Magic Kingdom. If you would like to try and circumvent this, try specifying the Contemporary as your destination and walking the 5 minutes to Magic Kingdom. There is a possibility that you will be stopped when trying to enter the Contemporary grounds but just state that you are there for dining! Epcot: The pickup and drop off location for Epcot is near the Epcot bus stop however, we recommend using the Beach Club Hotel as your destination and walking the short distance to the International Gateway entrance. This usually ends up being much quicker! Hollywood Studios: The pickup and drop off location for Disney’s Hollywood Studios is at the front entrance, near the Hollywood Studios bus stop. Animal Kingdom: The pickup and drop off location for Animal Kingdom is at the front entrance, near the Animal Kingdom bus stop. Typhoon Lagoon and Bilzzard Beach: Both of Disney’s water parks have convenient pickup points right near their front gates. Keep in mind that Uber is used to riders requesting rides around Walt Disney World and the Uber app will keep you informed as to pickup and drop off points at the parks and hotels. How many passengers can fit in an Uber or Lyft car? Uber and Lyft both have a variety of car services that range from small sedans to large SUVs depending on your needs. To find which car type is right for your group (including your luggage!) view this chart here. How do car seats work with Uber in and around Disney World? Luckily, Uber offers rides with car seats already installed for those of you traveling with young children. 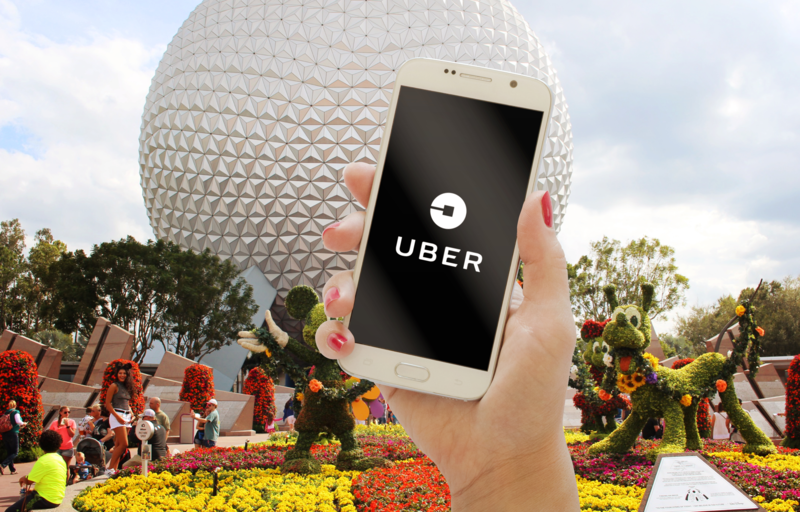 Within Walt Disney World, Universal, and in much of the surrounding Orlando area, you have the ability to choose either “UberX Car Seat” or “UberXL Car Seat” when hailing your ride. Keep in mind these do come at a bit of a surcharge ($5 to $10), and you may have to wait longer if there isn’t one nearby. Another option is to order a traveling car seat for your trip - believe it or not some of the options can even fold down to fit in a purse! What are the Lyft Minnie Vans in Walt Disney World? Lyft Minnie Vans are red and white polka dot vans that can be spotted around the Walt Disney World parks and hotels. While Minnie Vans are part of the Lyft brand, they are actually a bit different than a normal Lyft car. All Minnie Vans are driven by Disney cast members and the pricing is a bit more expensive. Minnie Van rides charge a minimum of $15 and then charge a per mile fee on top of that – approximately $2.75 per mile. Average Minnie Van rides around Disney property are typically around $30-35. Minnie Van rides can be ordered through the Lyft app and they accommodate up to 6 passengers. One major bonus of the Minnie Van is that every ride comes with 2 car seats for families with small children. We hope this article helps to make your Disney Trip a little less stressful and a bit more magical! If you have any other questions that we did not cover, feel free to ask on our forum!